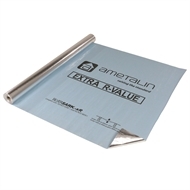 Ametalin SilverSark® xR is a double-sided reflective foil backed pliable building membrane; 97% reflective on the bright side and 93% reflective on the anti-glare side. It is an excellent barrier to radiant heat, enhancing the energy performance and thermal comfort of a building, while providing a physical layer to protect against water and air infiltration. Strong, durable and versatile Ametalin SilverSark® xR offers superior tensile strength, designed for use as a roof sarking, under tile or steel roofs and as a wall wrap, in all regions of Australia in residential, commercial and office buildings. Custom printing available. Advertise your business & promote your brand on Ametalin SilverSark® xR. Contact us for more information. Ametalin SilverSark® xR is not designed to withstand prolonged direct exposure to the elements. Accordingly, upon application of this product the outer roof should be installed without delay. Aluminium foils should not come into contact with wet concrete or mortar, as the aluminium is susceptible to alkali corrosion. 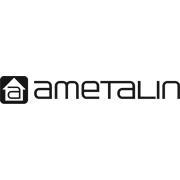 Ametalin SilverSark® xR should be installed in accordance with AS/NZS 4200.2:1994 Pliable Building Membranes and Underlay’s, Part 2: Installation Requirements. Ametalin SilverSark® xR is installed with the blue anti-glare side facing out.